Scented. 3 to 4 Feet. Late July flowering. Named for the little Italian Coastal town of Formia which in the ancient Greek means 'Landing Place', where to this day the remains of Roman built breakwaters can still be seen. 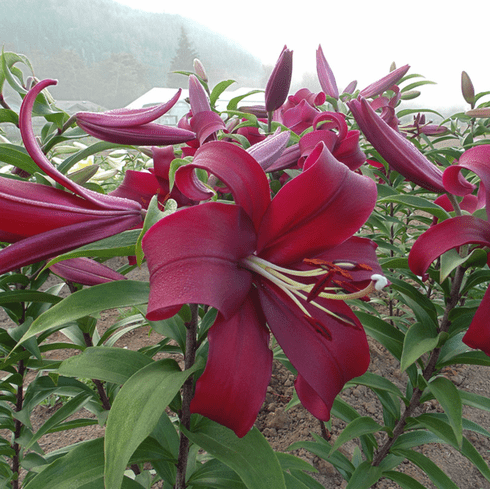 The lily 'Formia' will give you a place to "land" in your garden each day to absorb the exceptional beauty of its black-red flowers. The out to upfacing flowers are free of spots and sport nothing but pure, rich color, even on the reverse side of the petals. This fragrant, Late July bloomer, ranges normally in the 3 to 4 foot range, but with fertilizer and care, can easily hit 6 feet. A viewing experience when coupled with whites such as 'Saronno' and 'Gizmo' as a backdrop. NOTE: "Fog" in the background is actually smoke from the 2018 N. California fires that made its way into our little valley.